Each evening I walk next to the river in order to ground and nourish myself. I sense the healing presence of this wild strip of land that holds the water, and want to carry that presence within me, onto the locked psychiatric unit where I work. My desire is to sow seeds of wildness in a setting that often equates conformity and compliance with healing. This piece arrived through allowing the myriad voices of the river corridor to speak through my imagination. It is equal parts waking dream and manifesto. This piece arose as a response to the news that the alpha female of Teanaway Washington’s federally protected wolf pack was shot and killed. Her death occurred during hunting season, and at the time I began writing, a suspect had been identified. Each gesture, creative or destructive, is communication, an opening into conversation with the living world. In indigenous cultures the hunt has been a conscious conversation of sacred reciprocity, the prey animals dreamed, honored and thanked. In this piece I imagine the wolf’s response to being shot at a distance, with a high-powered rifle, without meeting the eyes of the hunter. Perhaps beneath the projections and mistaken beliefs, the killer unconsciously seeks connection, with the wild, with an exiled part of himself. Yet, to claim full kinship with the nonhuman others would be to open himself to the grief and vulnerability of living in an animal body, to being prey, to being poisoned, marginalized, cast out and attacked. So he reaches out through the wounded language of violence, fearful of giving up the false security of his stance of separation. As one who has hunted, killed, and listened closely to the non- human others, I know in my bones that the living world desires intimacy with humans, that it responds to our clumsy and mistaken attempts at conversation with grace and power. This poem is an offering to the clawed, feathered, scaled and human others who are hungry for connection. Sheila Murray grew up in New England and New Jersey, and was called to the west by the twin sirens of imagination and desire. 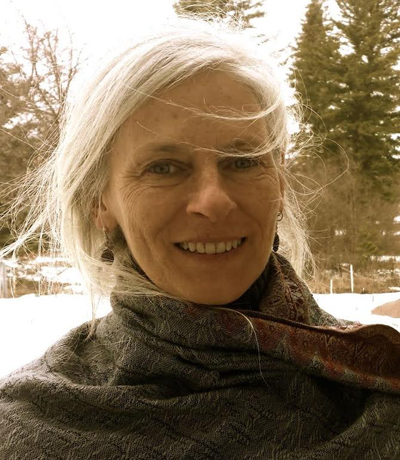 She earned a master’s degree in depth psychology from Pacifica Graduate Institute, and recently completed a yearlong Soulcraft intensive with Animas Valley Institute. Sheila continues to explore the mysteries of nature and psyche from her home in the Flathead Valley of Montana.